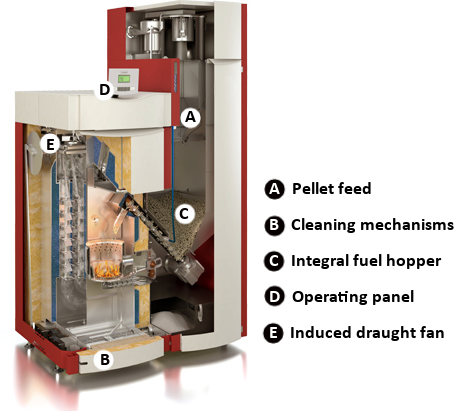 There are a vast amount of biomass boiler available, with varying costs, efficiencies, sizes and suitabilities, below are descriptions of the more common varieties. 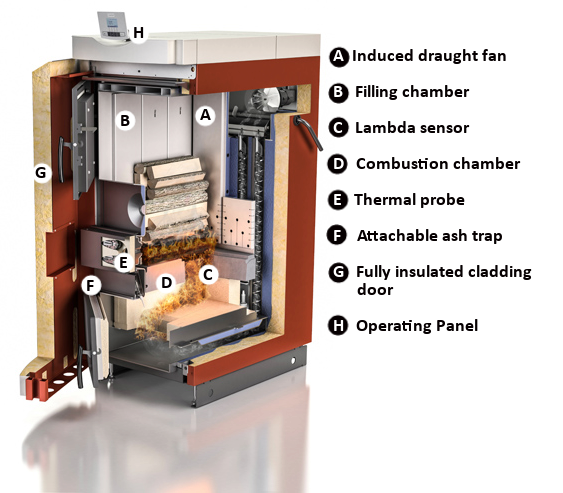 What are the different types of biomass boilers? Usually the most efficient type of biomass boiler: the wood – usually in the form of pellets or wood chips – is automatically fed into the boiler’s combustion chamber from a large hopper or silo (sometimes these can hold a year’s fuel) using an auger screw system. Biomass can also be used to fuel combined heat and power units, which generate both heat and electricity. CHP units are, however, very expensive for small scale domestic and business properties, and there are far cheaper ways of generating electricity. CHP systems can be suitable for larger buildings, and given that they produce electricity and heat energy, may be eligible for Government Feed-in tariffs (FiTs) as well as the Renewable Heat Incentive and Renewable Heat Premium Payment. Less expensive than fully automated boilers, but requiring more input from a system operator, semi-automated systems are better suited to large installations such as farms and larger properties. These units come with an attached, large hopper that can accommodate a reasonable amount of fuel, but will require replenishing manually more often. These boilers have various operating modes – full, reduced and slumber with specially designed electronic controls. 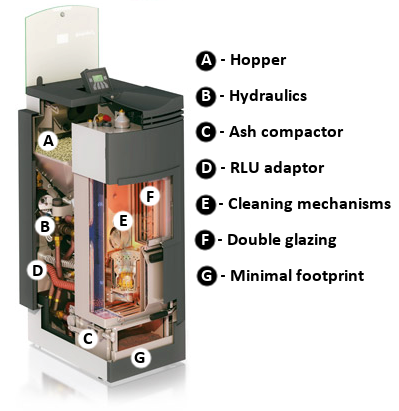 These boilers are compact in size and designed specifically for the residential market. They look great and can be situated in living areas as they resemble a standard log burner more than the larger units. Because of the increased aesthetic appearance and compact size, these units have become much more popular recently, especially in smaller properties. 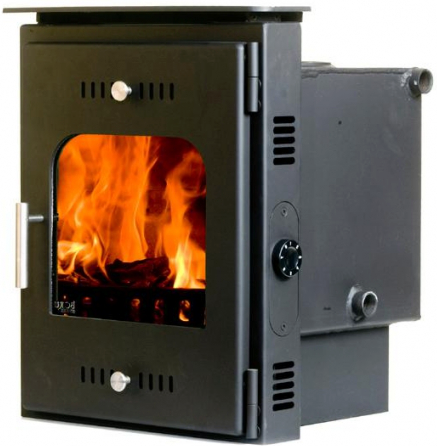 Generally cheaper than boilers with automation, these are suitable for those with easy access to firewood. These must be hand fed, so can be rather time consuming, however, with the right hot water buffer tank and optimised usage, these biomass boiler systems can be a very cost effective solution for those with a large property and reduced budget. Wood stoves are the most basic of biomass heating systems other than that of an open fire. An open fire is by far the cheapest option but the overall efficiency is a meagre 15-30%; this is because most of the heat is lost in a puff of smoke, up the chimney. Today’s wood stoves are highly efficient and can serve the heating requirements of an entire home if required and not just that of a single room. The ‘high efficiency’ and ‘clean burn’ models can offer an impressive 80% efficiency and can come with integral boilers, so hot water can be supplied as well.